1. Rabbi Aryeh Levin of blessed memory was born in Belarus, and studied in Slutsk with the Gaon Rabbi Isser Zalman Meltzer, and later in the well-known Volozhin Yeshiva. 2. At the age of 19, the Russo-Japanese War began. Rabbi Levin took the opportunity to fulfill his dream and to move to the Holy Land. He wrote: "In those days, the clouds of war filled the sky, this is the war between Russia and Japan. In my heart I decided to go fulfill my deepest desire to immigrate to the Holy Land. 5. Rabbi Aryeh Levin was known for his compassion for the sick and the prisoners. He was given the nickname "the Prisoners Rabbi" after spending 25 years visiting the Jewish prisoners in prison. During the British Mandate he came to visit the underground prisoners, to encourage their spirit and to write letters and appeals for them. He was honored to visit the prisoners sentenced to the gallows and to encourage them in their last hours. On Saturdays and holidays, he used to walk to the prison to visit the prisoners. In addition, Rabbi Aryeh Levin was the only one who did not hesitate to visit the Lepers Hospital, and to extend all necessary assistance to those infected with the terrible disease. This story teaches that it’s possible many times we comfort or help people in trouble but we quickly forget them and they’re still left with their difficulties. The trick is to continue helping and constantly see if your neighbor or friend or a person may need support or just small talk to and encouragement. We can learn this from Rabbi Aryeh, who understood the soul of the others and knew when it was difficult for them and they needed encouragement. Rabbi Aryeh also observed the mitzvah of visiting the sick with both spiritual assistance - encouragement for the patient, and material assistance as well. He would bring supplies to the patient, and also prayed for the patient's recovery. 8. When Dr. Yitzhak Raphael was deputy minister of health, he asked that an office car pick Rabbi Aryeh up daily and drive him to visit him in the hospitals (Rabbi Aryeh was already old and it was difficult for him to walk, but every day he would walk to the hospitals). Rabbi Aryeh refused and said: "I am old and it is hard for me to learn. All that remains for me is the mitzvah of visiting the sick. I prefer to walk and earn the reward of walking." 9. The British Mandate Authorities asked Rabbi Aryeh that when he visited the Jewish prisoners to also visit the Arab prisoners .The authorities saw that Rabbi Aryeh's visits encouraged and calmed the prisoners. Rabbi Aryeh agreed, for after all, "the likeness of man was created in the image of G-d". 10. Rabbi Aryeh Levin used the lottery of the Vilna Ga'on, in order to identify the bodies of twelve members of the "35" Department, who were returned 18 months after their death. 12. 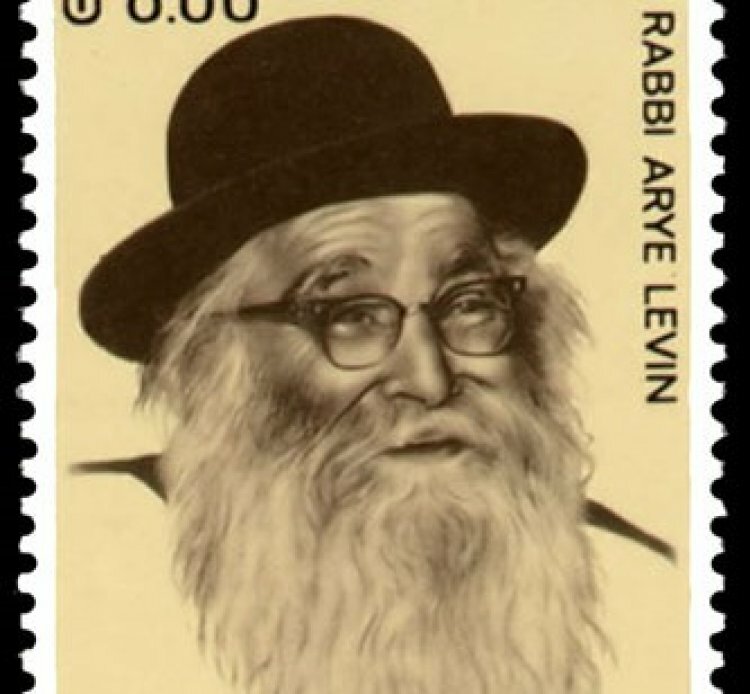 Rabbi Aryeh Levin is buried in the Sanhedria cemetery in Jerusalem. On his gravestone, part of his will is inscribed: "All those tied to me in my life, especially those who approached me with the closeness of G-d, whose sorrow and suffering I felt. I won’t forget them; if I have any other right after 12 months to ask for mercy for them before the throne of glory.” Also inscribed is the following instruction to visitors: “I ask anyone who comes to my grave to say: 'I firmly believe that there will be a resurrection of the dead when the time that the will arises from the Creator, blessed be His name and His memory will be elevated. A. "It was always my goal to instill in my heart a strong belief in personal divine providence." C. "I was very careful to welcome everyone graciously until it became my second nature. I was also careful to be first to greet everyone with Peace." D. "I have always tried to be among those who get insulted but not insult back, to hear my embarrassment and not respond, and I immediately prayed that no one would be punished because of me." E. "I tried with all my strength to instill the love of people in the hearts of my household. Instead of planting hatred for sinners, I tried to instill love and honor for the G-d fearing." F. "It's easier to learn a few languages ​​and talk using them, than it is to avoid talking unnecessarily." G. "My dear sons, don’t enter any controversy in the world, and do not hold onto dispute, even for the sake of Heaven."